I love the washability. The only reason I didn't give a 5 star rating is because the corners do tend to lift a bit and that's a bit annoying. Overall, I definitely will buy more of these. This my first ruggable and I’m happy with it. 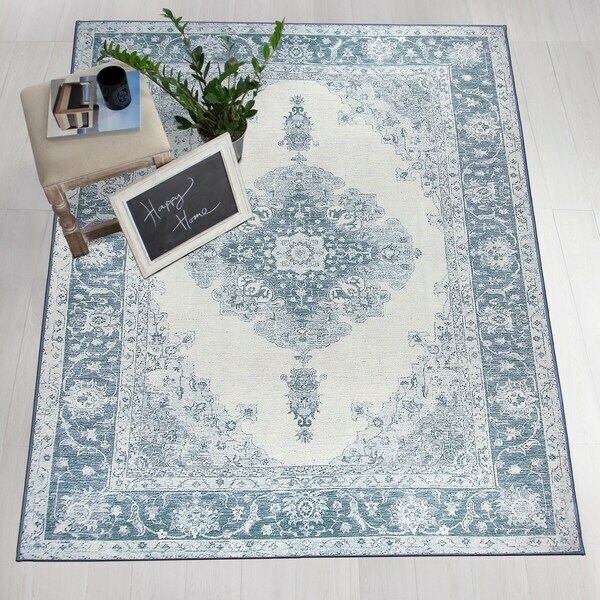 The rug itself is very pretty and good quality and will easily fit in my washer. The pad holds the rug in place better than any pad I have ever bought separately. This is perfect for a household with pets. The rug has more of an aqua tone than sky blue. Love it! This rug is very beautiful. We have it in our foyer, and everyone thinks it is an expensive oriental rug. We have washed it 8 times (potty training two new puppies) and it still looks new. We will probably never buy any otber rug brand again. I get so many compliments on this rug. It looks very expensive and it really does clean up to look like new in the wash. We have a siberian husky who sheds and tracks in dirt and it has held up well under her use. It feels soft and stays flat. On my computer screen the color looks slightly more teal and less blue than it does in person. Love, love, love Ruggables. Perfect for those of us who have pets. The convenience of pulling the top off to wash it can not be beat. It looks brand new after every wash. Only wish Overstock sold just the tops so I can order other designs to swap out every now and then. Awesome rug and wanted something washable. Colors look about right (as pictured). This worked great for older dog we have that sometimes didn't give you enough time to get him outside he would pee on area rug. Easy to clean. 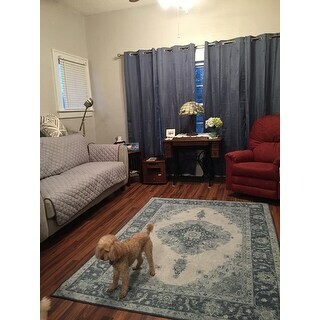 Rug was so much better than I ever thought it would be. Looks great & great quality. Finally a nice rug for pet owners. Love this rug and the fact that is it washable. It is a little more vibrant and blue than the pictures, which is great. Highly recommend! This rug looks amazing on by back porch. Beautiful and practical. Wish they still had this pattern. "Is the blue one the greener side or more true blue?" This is a true blue. "Once my dog has an accident I know I can wash the top of the rug but does the urine smell go into the pad so he will repeat his deed in the same place?" 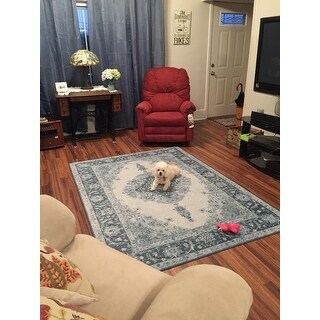 The rug cover is not waterproof, so it really depends on how soon after you notice the pet's accident and how much liquid is on the rug. If the accident was noticed immediately, the fluid should not seep to the pad. Small pet accidents shouldn’t seep through either. If it was a large pet accident and it was left over time, there is a possibility it will seep through to the rug pad. However, wetness will not seep thru the pad and get on your floors. To spot treat the pad, simply apply pressure using a cloth or towel to absorb the liquid, then spot clean with warm soapy water if needed. To thoroughly clean the rug pad, you can simply wash the rug pad down manually with light soap or detergent and rinse/hose off then lay flat to dry.